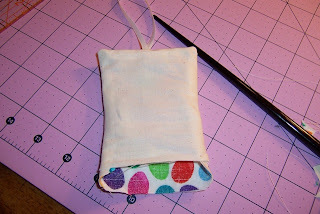 So pick your favorite fabric and make a PickAPocket - great for any occasion. NOTE: if you wish to have a "puffier" look you can back this piece with some batting or flannel and add some quilting stitches. 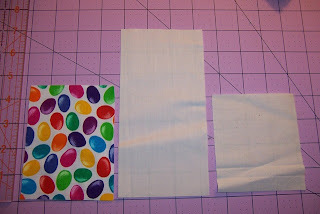 Fold the 7" piece of fabric in half so that it measures 3.5" x 3.5" and press. 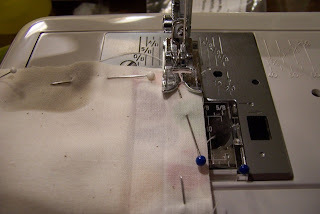 You can topstitch the folded edge if you wish, but as this pocket will not see a lot of wear, it is not necessary. 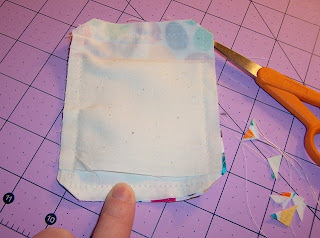 Layer the folded pocket over the front fabric, right sides together, with the folded edge up and raw edges at the bottom. 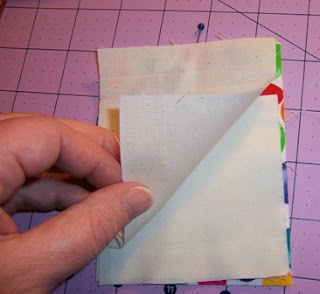 Lay the back fabric over the layered focal/pocket stack, right sides together. 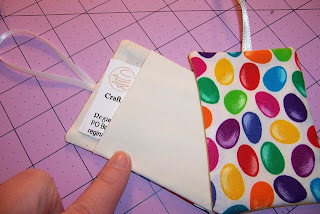 You will align this with the top edge of the stack where the ribbon is attached. NOTE: It will NOT align at the bottom - this is intentional and that raw edge will allow for turning later and will be hidden inside the pocket. 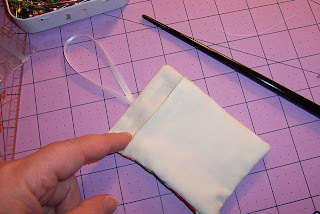 Turn the backing to the outside, pulling the ribbon up and using a chopstick or tool of choice to push out the corners. I like to press at this stage to get a crisper overall finish, but you can wait and press it all at the end. 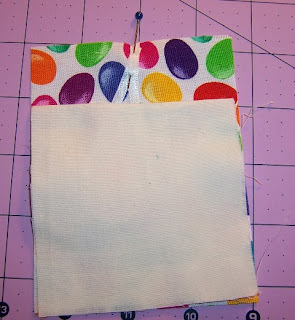 Turn the pocket to the back, exposing the entire piece of focal fabric in the front and creating a pocket and backing on the back. Again, push out the corners with your "pointy stick". Press. You are done! Insert your gift card, a note, chocolates, a pair of earrings - whatever you like, and give this little giftie away! 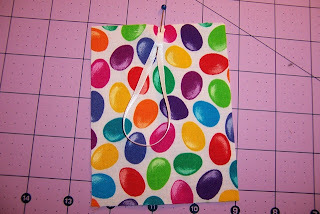 If you are concerned about a little giftie falling out, you can add Velcro Fusion to the top edge of the pocket. Beading, embroidery, quilting and other embellishments add dimension to the front piece - that is your little pallette -have fun with it!!! The charity quilt is done - I need to get a picture of it with the binding (made from scraps leftover from the center blocks) - but here it is with the borders. I ended up with a sunny yellow on the back - hard to see in this picture but some of the fabrics have yellow bubbles in them, and I wanted to pull that in. I put a narrow strip between the center and the borders -this picture does not really show it well, but it really popped the center. I also machine quilted this - all stitch in the ditch -but I am getting more comfortable with Zoe and her walking foot (which has never liked me) and was very pleased with how this turned out. I waited until after it was done to wash it - so it got that crinkly-ness to it, which I like. I am actually having a tough time parting with this one -even though it is for a good cause. Maybe I will get lucky and have the winning bid and get it back? Hmmmm -now there's a plan. Do you want insurance on that? Today I took a huge leap of faith and shipped four quilt tops off to be machine quilted. The leap of faith was not at all a reflection of the skills of the person doing the work for me ... it was a reflection of my doubts in my own skills. Showing my "backsides" to someone else is like walking outside in my underwear - somewhat embarrassing. You always wonder if the people that see you like that can ever get that mental image out of their head? ...but today I took that leap of faith and put my "undies" out there for someone else to see. "What's the value on this package?" 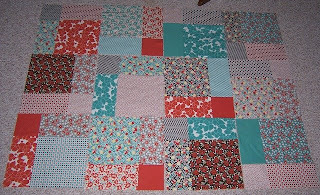 With not a lot of time to work with - I grabbed a Moda Layer Cake that a friend had given me and decided to do a quick and easy disappearing 9 patch. So after dinner, I grabbed my Layer Cake (Hello Betty) and started to spread it out on the living room floor to form my initial 9 patches. My Munchkin took a look at what I was doing and said "you need scotch tape, Mommy, to put those together." And he ran and brought me the tape dispenser - "I like helping you, Mommy." Ah - the wonders of scotch tape when you are 4 years old. The magic substance that can fix book pages, tape parts of toys back together, and even - it seems - make a quilt! So this is my little way of helping - helping Patrick and his family, while thinking of the others I know who have dealt with this as well. Wishing you all Scotch Tape Magic and healthy days ahead. Usually a project that has not been finishished is a UFO (unfinished object) or a WISP (work in slow progress). I picked fabrics to match my living room sofa (a blue and white and green plaid) and planned to hang the quilt on the wall over the sofa. 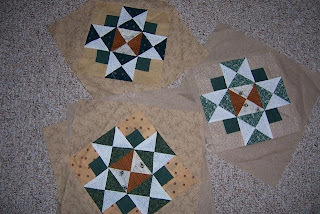 It was a one day - all day class - and we spent much of the time cutting all the pieces for the entire quilt. I then took it home and continued to work on it. The project, unfinished, got packed away. I looked at it a couple of times, but was busy with other things. And besides, the great wall space over the sofa was gone, and soon the sofa was also "gone" - under a slipcover. These colors no longer matched my decor. 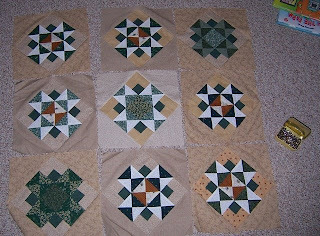 Two years ago -convinced I would never ever ever finish this quilt, I "borrowed" a couple of the blocks to make tote bags out of for some quick gifties. 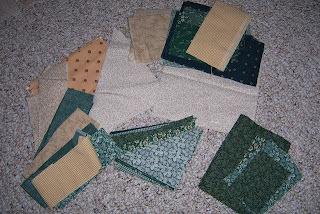 I also "borrowed" some of the larger pieces of fabrics, for tote bags, scrappy quilts, and other projects. 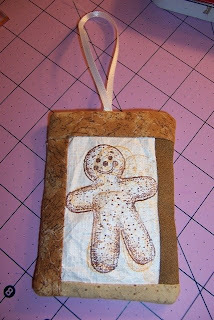 On Sunday I was cleaning out a drawer in my craft room, and came across the bag with this project in it. 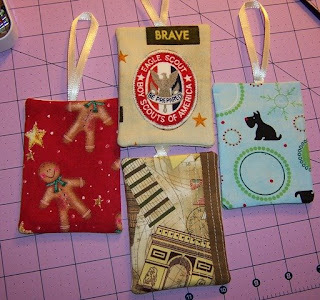 I decided to empty it out and re-distribute the fabrics and scraps to their appropriate places. HUH??? I thought I had lots more to go on this quilt - if I have SIX done, and took out TWO already - that means I was just ONE block short when I "borrowed" for the tote bags. 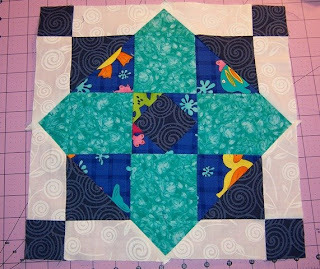 Most of it is already cut into small and medium sized triangles -there are some 2 1/2" strips, a few wider scraps and a couple of squares. So making the border as designed - not going to happen. 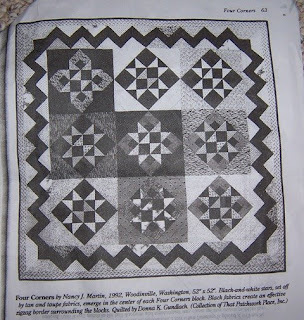 I am not even sure at this point if I am going to set the squares all together, or introduce some sashing to get back some size and break up the beige a bit - it's a bit much. Not bad for 10 years later - though. 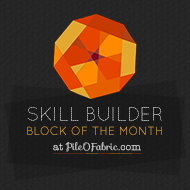 This block was a bit more challenging for a few reasons. 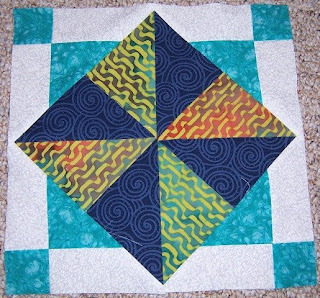 The first being that I am getting to the end of some of my fabrics - I had a few different ones in mind for this block, but the remaining pieces were just not large enough. 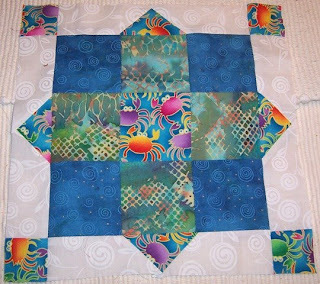 Even the crab fabric was problematic - I did not have a big enough piece to cut a square and sub cut it into 4 triangles - so I ended up making a triangle template and cutting the pieces out of odds and ends of scraps in order to get enough for this bock. It gave me a few problematic edges that I had to be careful with - but I think I got it ok. 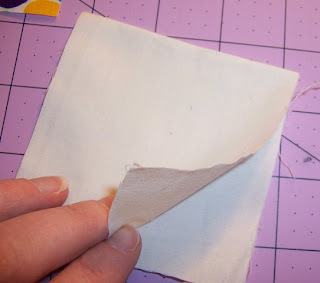 The other challenge was sewing two angled pieces on either side of a triangle and having the entire strip come out even. I am not sure if there is a trick to doing that consistently accurately. I guessed -and 3 of the 4 turned out well -one was a bit wonky. 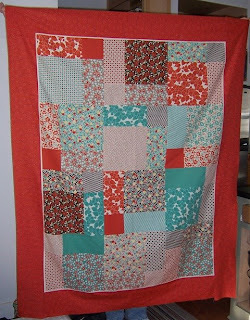 If anyone has some tips on that one - let me know - because I think there are a few more of those lurking in this quilt. This was block #5, and when digging through my scraps and composing the colors for this block, the yellow and green reminded me of something I had encountered while living in Japan - something called the shoshinsha. Since this quilt is becoming bits and pieces of "history" I thought that would be a fun and subtle way to include "Japan" in this quilt. Of course some things are so subtle that I'm the only one who gets them. The blue bubbles - if I remember correctly - are also found in DragonBen's baby quilt. Of course I am getting very little done on other projects right now. Hubby and I had a date night on Friday (go RIT Hockey!) and a birthday dinner at Hubby's folks yesterday (Happy Birthday, Sweetie), so I have been out of the sewing room for a couple of days. 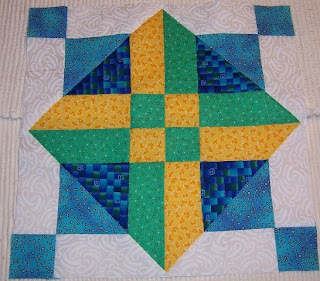 Here's block #3 - I'm convinced now that Lazy Sister Sue picked this BOM for me to participate in because of all the triangles!!! I have normally avoided them - don't like cutting them - don't like sewing them -I tend to get them all wonky and twisted. 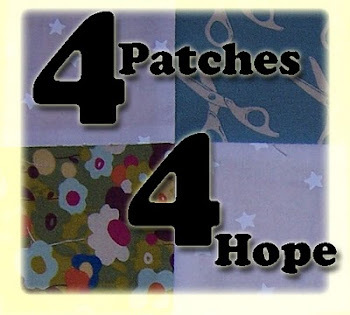 Well - maybe it is this pattern - or maybe just more experience -but I am doing better with these. Only 9 more to go - and block #9 got posted today! Woo Hoo!!!! Through getting to know Joan, I have learned that she is as adept in her kitchen as she is in her sewing room, and have enjoyed reading some of her cooking exploits both on her blog and on Facebook. So last fall, when Hubby and I started our cooking blog Any Ideas for Dinner, I asked Joan if she would consider guest blogging one day. 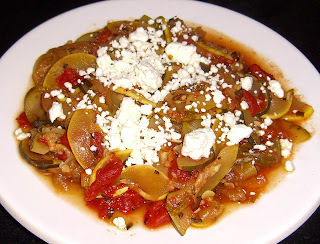 Late last week an awesome recipe and accompanying photos appeared in my email inbox (no accompanying samples, however... darn) - and they are our featured Guest Post today at Any Ideas for Dinner. I love it when my worlds collide - it brings such wonderful things!